Derby scorer Jermain Defoe retains his belief that Sunderland will beat the drop, despite again surrendering victory in the dying stages. For the third game on the spin, Sunderland held the advantage against relegation rivals Newcastle, yet finished with a solitary point after Aleksandar Mitrovic's 83rd minute header earned a share of the spoils for the Magpies. Sunderland's inability to keep a clean sheet continues to hamstring Sam Allardyce's attempts to keep the club in the Premier League, with the streak without a shut-out now standing at 16 games. 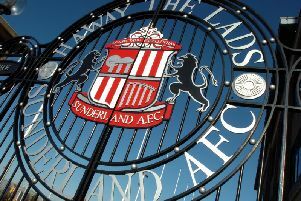 But striker Defoe - whose first half volley took his tally for the season to 12 top flight goals - says Sunderland's performance levels over recent weeks have to give them heart that they can beat the drop. Defoe said: "We'll keep it going. We've got some massive games coming up, but if we play like that, we'll be fine. "We always knew the second half was going to be difficult. "They had to come out and push to create chances. "But it's just disappointing to concede a late goal again, as we needed three points." Sunderland had been on top for the opening hour at St James's Park, with a superb save from Magpies keeper Rob Elliot preventing Allardyce's men from doubling their advantage. But as the clock ticked down, Sunderland sat deeper and deeper, and an unconvincing Newcastle side scrapped their way to an equaliser, which keeps both North East clubs in the relegation zone. "I thought we controlled the first half and had more attempts on goal," added Defoe. "They didn't really have any attempts on goal, other than the free-kick on the edge of the box. "In the second half they pushed because they were at home and we tired as we were defending so hard. "Conceding a late goal again, everyone's disappointed. "We'd worked so hard and were solid."